SERIES 8000 | Process Equipment & Supply, Inc. Shown below are specifications for tanks with capacities up to 40 gallons. Branson ultrasonic tanks provide versatile ways to meet localized cleaning needs in a variety of industrial settings. Type 316L bright annealed stainless steel construction permits use of a wide range of cleaning chemistries. The four standard sizes range form 5 – 40 gallon capacities. 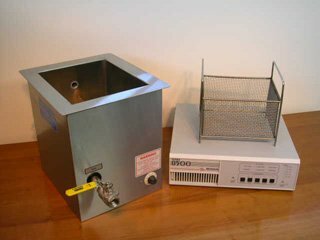 All tanks can include optional thermostatically controlled heat to improve cleaning. Branson offers efficient piezoelectric transducers on its tanks. These composite PZT units offer excellent energy conversion, stable performace under all operating conditions and are guaranteed for the life of the system (excluding cavitation erosion). Transducers are offered in two frequencies: 25 kHz and 40 kHz. Generally 25 kHz is preferred for large, massive parts and 40 kHz for smaller, more intricate parts or components with complex geometry. Each Branson cleaning tank must be served by a seperate power supply operating at the same frequency (25 or 40 kHz) and rated for the same number of transducer elements. True variable power control makes the cavitational intensity (not duty cycle) infintely and lineraly variable from 20% to 100% which allows mathcing the power to your application requirements. Auto tuning maintains optimum operating frequency around your application. The generator automatically and dynamically adjusts to your conditions regardless of changes int he operating environment.